I recently had the opportunity to interview historical fiction and fantasy writer Scott Oden about his 2010 historical sword and sorcery novel, The Lion of Cairo. Set during the Crusades, this novel details the exploits of Assad, of the al-Hashishiyya, known as The Emir of the Knife. This novel blends historic period detail, with a large dose of The Thousand and One Nights flavor combined with the pulp sensibilities of Robert E. Howard. A shout out to Dave and Deuce for providing me with this opportunity from out of nowhere and of course, my sincere thanks to Mr. Oden for taking time out of his busy day to field my questions. 1. Who are your literary influences and/or favorite writers? Probably the single biggest influence on my career has been Robert E. Howard. I discovered the Conan stories (Ace editions) at a fairly young age; when I turned my hand to writing stories of my own at age 14, I started by simply typing the opening to whatever Conan story struck my fancy that day. I’d slowly progress to a point where I’d add my own dialogue, rework the action, and take the story in a different direction. I never finished any of these “Frankenstein’s Monster” pastiches, but it taught me how to use language, how to pace, how to format dialogue, etc. Other influences include JRR Tolkien, Mary Renault, Karl Edward Wagner, and – later – Steven Pressfield and Tim Willocks. 2. Can you give your best elevator pitch in describing The Lion of Cairo? 3. You previously published two novels that were set in the classical world, 2005’s Men of Bronze and 2006’s Memnon. What caused you to jump ahead in time to write a story set in the waning days of the Fatimid Caliphate? At the time, I’d grown weary of both straight historical fiction and Antiquity. So, I returned my advance from my previous publisher, canceled the book I’d planned with them, and struck out alone to try and carve a kingdom from the land of Fantasy. I’d made a few contacts in the industry – the associate publisher at Thomas Dunne Books, among them. I spent a couple of weeks hammering out a pitch for a secondary-world fantasy with an Orc as the protagonist and sent it to him. He liked it, but not overmuch, and sent back that he really wanted to see an REH-inspired medieval fantasy with an assassin “hero”. I took a stab at that, drafting a 12-page synopsis. His reply, then, was that he needed more detail; could I try again? So, I went back to the drawing board, and in a month or so I’d drafted a 50-page single-spaced synopsis of what would become The Lion of Cairo. He loved it, wanted it, and wanted three more books, besides – a trilogy of Assassin novels and the “Orc book”. 4. When it comes to writing historical fiction, what does the process look like for you? How much time do you spend immersed in research prior to the actual composition of the novel? Do you utilize daily writing goals? Now, here’s the thing about The Lion of Cairo: it is stunningly inaccurate from an historical standpoint. I drew from all periods of Cairo’s history to create the city of the Arabian Nights. I’ve got ancient Heliopolis, pre-Islamic, early Islamic, Fatimid, Ayyubid, Mameluke and pure fancy all working in unison. It looks like historical fiction – perhaps too much like it – but even scratching the surface of Cairo’s history will reveal how far my city wandered from its roots. My starting point with The Lion of Cairo was with maps and histories of the city itself. I started with the landscape, which I remade to suit my purposes using REH’s Crusader tales as my guide, especially a story called “Gates of Empire”. My commandment to myself was: does [historical fact] lend itself to telling a good story? If not, I either cut it or altered it to fit. So, most of the “historical” figures that appear, such as Shirkuh and young Yusuf Ibn Ayyub, are composites built from a combination of truth, REH, and either Harold Lamb or Stanley Lane-Poole (with a dash of William of Tyre and Usāmah Ibn-Munqidh for color and the veneer of authenticity). My young Sultan, Rashid, was entirely cobbled together from bits of other notables. The key – and, if you ask me, one of the reasons the book failed – is to make the pieces I create look as authentic as possible. I don’t want readers to know, really, what I invented and what historically occurred. As for writing, I try to write every day, and have a word count goal I try to reach – usually 1500-2000 words. 5. An interesting facet of the novel is that you drop in supernatural elements (sorcery, necromancy etc.) in a real world, historical context. Why did you choose to go this route as opposed to a completely made up secondary world where the supernatural can be commonplace? Partially, because the supernatural was commonplace in our historical past – from a certain point of view. Our ancestors believed in the stories we label as myths. They believed in their gods, their monsters, their witches and sorcerers, their ghosts; they believed magic could alter a person’s fate or send them to an early grave. They believed in omens and harbingers, that God talked to them through the ramblings of madmen and the arrangement of a pig’s entrails. Though I’m a child of the post-Enlightenment world, I vastly prefer the worldview of my ancestors. The other factor was a simple lack of confidence in my own ability to bring a secondary world to life. I mean, if I’m going to mine history for all the good bits and bobs, why not simply use history as my canvas and add a gloss of magic to it? 6. Is the magic system used in the novel linked to certain religious traditions or beliefs? No. I wanted something subtle, not flashy or filled with Dungeons & Dragons styled combat magic. If anything, I used REH as my guide, again. Magic has a price, is slow and ritualistic, and not suited for blasting off fireballs in the heat of battle. 7. Is the protagonist Assad, The Emir of the Knife, based on a historic personage or is he strictly a product of your imagination? Assad is a mixture. He’s part Jack Bauer (24), part James Bond, and part Conan. Some of his exploits are lifted from the actual histories of the medieval Assassin sect, while some are drawn from the mythical exploits of a real figure: the Afghan freedom fighter called Ahmad Shah Massoud, the Lion of Panjshir. Funny story: for the longest time, I could not fix Assad’s appearance in my mind. He was faceless. But, while researching some of the myths around Massoud, I caught a rerun of a post-9/11 docu-drama called The Path to 9/11. Actor Mido Hamada portrayed Massoud in the film, so I “borrowed” his look, added a scar down one cheek, and suddenly I could see my protagonist. He became real. Well, a couple years later, the UK publisher hired photographic artist Larry Rostant to create the cover for the UK edition; Rostant hired actor Akin Gazi (Knightfall, but who was also in The Path to 9/11) to model as Assad. And, as I’ve been told, Mido Hamada saw the book on Akin Gazi’s coffee table, read it, and promptly bought my other books. And then, he contacted me to discuss optioning some of them for the screen. We were both struck speechless by the bewildering synchronicity of the event – he was Assad before I knew him, and discovered me because his friend was hired to model as Assad. 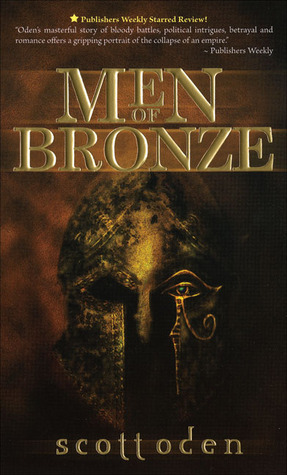 We’ve been friends ever since (for the curious: we worked together, along with Mido’s wife, the actress and writer Anna Bolt, to translate Men of Bronze into a miniseries; it’s currently making the rounds). 8. Assad bears some similarities with a certain doomed albino emperor. Both are what would be considered anti-heroes and both wield weapons with, let’s call it, unique attributes. Was this an intentional decision on your part or am I reading too much into it? 9. It’s my understanding that you had a series planned out for Assad but Thomas Dunne Books cancelled it due to lower than expected sales figures. Have you considered chronicling the further adventures of The Emir of the Knife in alternate forms? Be they short stories, novellas or comic books? I’m still considering going back and finishing the series, either as self-published novels or novellas, once my current contract with St. Martin’s Press is fulfilled. I’d love to do a graphic novel, but no one’s approached me to write one. I’m not great with short stories, so I’d most likely go with something longer form. 10. Why should fans of sword and sorcery fiction read The Lion of Cairo? Because, in my opinion, it’s great sword and sorcery! It’s got all the hallmarks of the genre: cruel viziers, wily courtesans, thieves, stoic crusaders, eerie magic, an enchanted blade, and a rough-and-tumble protagonist who doesn’t spend much time lamenting the fact he’s a stone-cold killer. If you like the Arabian Nights, or the historical bits of Assassin’s Creed, or Robert E. Howard’s Crusader tales, you should enjoy The Lion of Cairo. 11. After readers finish The Lion of Cairo and are further interested in exploring more of your fiction, what book(s) from your bibliography would you recommend they move on to next? I’m partial to my latest, A Gathering of Ravens. This is the “Orc book” mentioned in a previous reply – but, rather than create a world, I decided to reverse-engineer Orcs into Norse myth. They’re the basis, now, for creatures like Grendel. Or, if you’re a comic reader, you might give an eye to the upcoming The Savage Sword of Conan from Marvel. I’ve written a 12-part prose novella – a sequel to REH’s “The Devil in Iron” – that will be serialized in the first 12 issues. I’m hoping to have the opportunity to dip my toes into REH’s Hyborian Age again, in the future. 12. If you were walking down a dark alley and a pack of knife wielding cultists jumped you, who would you rather have defending your back, Bob Howard or Harold Lamb and why? While my gut reaction would be to say Bob Howard, I’m going to do the heretical thing and say Harold Lamb. Why? Most people don’t really realize what Lamb did during WWII. He was his generation’s version of T.E. Lawrence – Lawrence of Arabia; where Lawrence campaigned in the shadows of old Araby, Lamb campaigned for the Allied cause in Persia and the mysterious East. While I do not discount REH’s skill with his fists, in that alley, surrounded by those knife-wielding maniacs, I want a man at my back who ostensibly may have more experience in the killing arts than one can gather from ice-house boxing matches. 13. Thank you very much for sharing so much cool, behind the scenes information on The Lion of Cairo. Where can people go to learn more about you, your books and any upcoming projects? Thanks! It’s been great! Look for me online at Facebook or Twitter (@orcwriter), or check out my website.